Home » Markets » Archive for category "Automotive"
CoxMHP fabricates custom made aluminum material handling carts for Aerospace, Military, and Automotive applications.. CoxMHP has vast experience high quality manufacturing of custom aluminum welded carts and material handling systems. Aluminum is known for its low density and its ability to resist corrosion, aluminum is a key component of our custom metal cart projects. These material handling carts are vital to the aerospace industry. Parts required for many of the aerospace and military applications require reliable high precision handling. A custom material handling is often required for heavy and or sensitive parts. Worker finishes custom aluminum material handling carts created to move heavy aerospace parts. These custom carts can become a tool in your material handling workflow for military, aerospace and automotive assembly and continued operational service. These carts are designed to set up the material handling and exchange process for you. 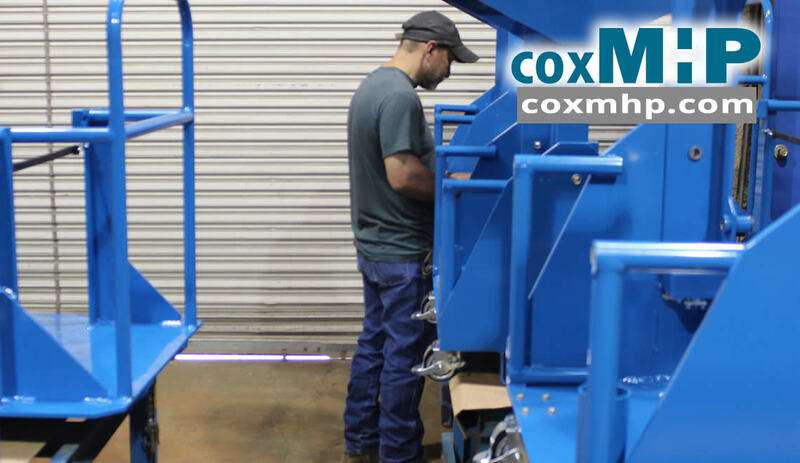 CoxMHP will make any aluminum cart needed for moving and installing parts and tools to get your job done correctly. Call CoxMHP at 1-866-280-5639 for a quotation on creating custom material handling carts for your specific application.